The walk is rain or shine. Lightning cancels. Click "Continue reading … " for directions. 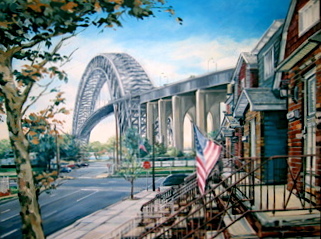 Local landscapes and landmarks as captured by painter Melissa Maiorano will line the walls of the New Jersey Meadowlands Commission’s (NJMC) Flyway Gallery during August. The exhibit, “Treasures in the Marsh: Paintings by Melissa Maiorano,” runs from Sunday, Aug. 2 through Sunday, Aug. 30. A reception for the artist is scheduled for noon to 2 p.m., on Aug. 2. Click "Continue reading…." for more information and more paintings. 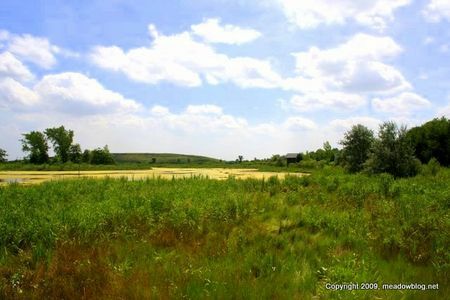 The Meadowlands Nature Blog is now on Twitter. 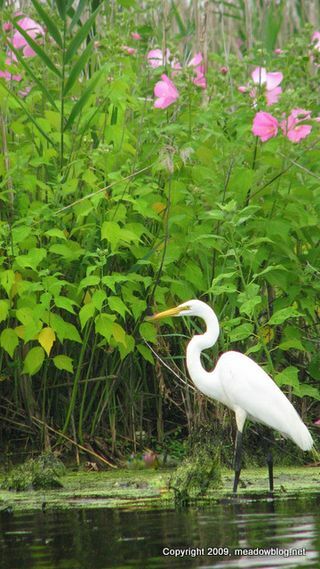 We regularly post upcoming nature events in the Meadowlands District, as well as noteworthy bird and butterfly sightings. If you would like to be notified whenever there's a new post, follow us at http://twitter.com/meadowblog or by clicking here and then clicking "follow." Kearny Marsh is looking pretty awesome these days. This is probably the best place in the entire disrict to see Hibiscus, which seem to be peaking. We took a kayak into the marsh on Wednesday morning and got great looks at a Least Bittern (flying), Blck-crowned Night Heron (perched and flying), a Great Blue Heron (flying) and the Great Egret at right. Best place to launch your kayak is at the norh end of Gunnell Oval. 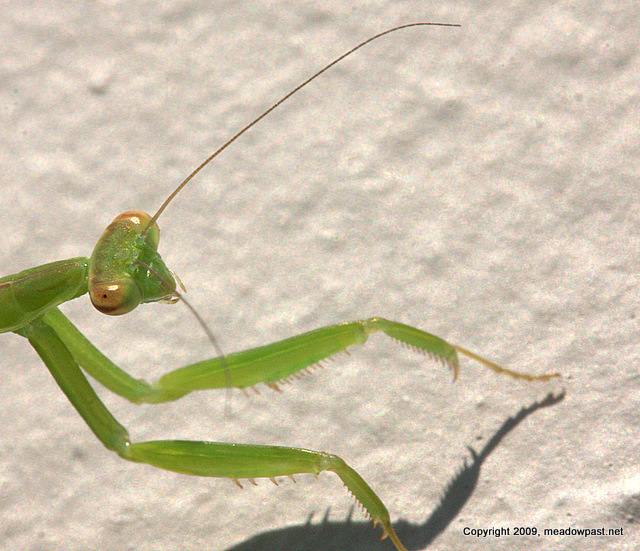 Praying Mantis at DeKorte Butterfly Garden this a.m. 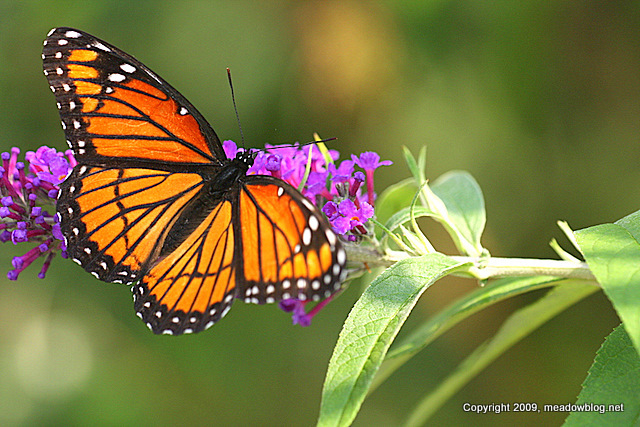 The improving butterfly season continues at DeKorte Park. Yesterday at DeKorte's butterfly plantings we saw Monarchs, Viceroys (above), Red Admirals, Eastern Swallowtails, Black Eastern Swallowtails, Summer Azures, Wild Indigo Duskywings, Silver-Spotted Skippers, assorted other skippers, and Cabbage Whites. At DeKorte at least, things have really been picking up in the last two weeks. When it comes to butterfly identification, this one is always a big question mark. 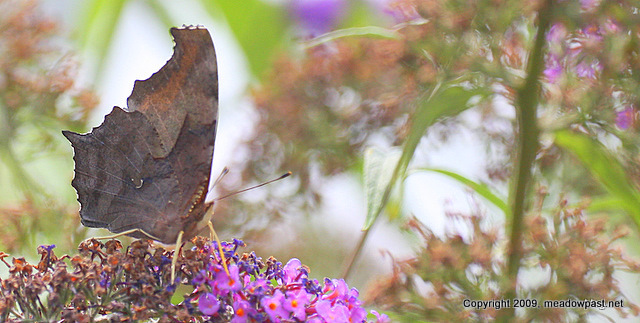 Click "Continue reading…" for answer, and a shot of this butterfly in flight.